For upstand and parapet walls. Polyfoam Upstand Board is used for the thermal insulation and protection of upstand and parapet walls. The extruded polystyrene content of Polyfoam Upstand Board has a thermal conductivity of 0.033W/mK, the facing board has a thermal conductivity of 0.47W/mK. 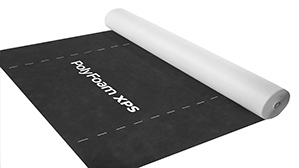 Polyfoam Upstand Board is a laminate of Polyfoam high performance rigid extruded polystyrene (XPS) with a tough, weather resistant facing board. Polyfoam XPS represents no known threat to the environment and has zero Ozone Depletion Potential (ODP) and uses a blowing agent with a low Global Warming Potential (GWP). 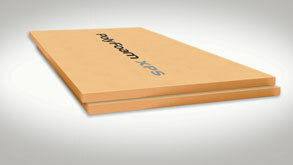 The XPS content of Polyfoam Upstand Board is non bio-degradable and 100% recyclable. The extruded polystyrene content of Polyfoam Upstand Board is manufactured in accordance with BS EN 13164, EN 50001 Energy Management Systems, OHSAS 18001 Occupational Health and Safety Management Systems, ISO 14001 Environmental Management Systems, and ISO 9001 Quality Management Systems, as certified by Bureau Veritas. The continuous service temperature limit of Polyfoam Upstand Board is up to +70º C.
The weather resistant facing board on Polyfoam Upstand has a reaction to fire classification of A1 in accordance with clause 8 of EN13501-1:2007. The XPS content of Polyfoam Upstand Board has a water vapour resistivity of 625MNs/g.m when tested in accordance with EN 12086. Polyfoam Upstand Board has a moisture absorption of 0.6% by volume when tested in accordance with EN 12087. Polyfoam Upstand Board is lightweight and easy to handle and install, the boards should be cut to size using a tungsten carbide tipped (TCT) saw, when cutting through the facing material it is advisable to wear a facemask. Polyfoam Upstand Board is supplied on pallets, labelled with identifying product and manufacturing data and wrapped in a polythene shroud for temporary protection during transit and on site. Ensure the boards are not stored close to open flames or other ignition sources, also avoid volatile compounds and chemicals such as solvents. Polyfoam XPS products should not be left exposed to prolonged sunlight as this will result in surface degradation. Where outside storage for extended periods is required cover with opaque/light coloured sheeting. The facing board on Polyfoam Upstand Board should have edges and corners protected to prevent chipping.